Have you ever wondered why the theme we hear about lately is inclusive? Safe place? No hate zone? I’ve been seeing this for a while now, as I’m sure you have too. What we see now is a system that is now working to make things safe for a few, but leave the majority vulnerable. As a parent, I wonder how that works with children? You have 4 kids, and one does something wrong, do you punish the other 3? Or let’s say one got it right, and did what was asked, do you reward the other 3 as well? Of course, this is just a crude example, but in our willingness to “not offend,” and “make a safe place,” we are in turn making the place unsafe for anyone who disagrees. Times like this, I truly wonder what would Jesus do? We have excellent examples of what he did and how it affected people of the time. The woman who was caught in adultery. We all know the story. A woman was caught in the act of adultery (although I wonder what were her neighbors doing to catch her in the act), and they were ready to stone her. To test Jesus, they bring her to him and expect him to carry out the punishment. Instead he says: “Those without sin throw the fist stone.” They all walk away leaving just Jesus and the woman. He didn’t say, “You’re okay. Wear your choices as a badge of honor.” Nope! He acknowledged that she was a sinner, and told her not to do it again. Today, it would seem that the scene would be backwards. Instead, society will say that she has a right to commit adultery, and how dare anyone call her sinner. We are living a society that has turned secular, individual, pragmatic, material, relativist, and that’s just to name a few! We remember of bits and pieces of the Gospel message, but it’s murky. We want to do what is right and just, but we are quickly forgetting exactly what is right and just. Nope! He told her that she was free to go, but, go and sin no more. That’s it. Mercy is forgiveness but is also an acknowledgment that we are sinners. To change the definition of mercy as: “I’m okay, you’re okay” would be wrong, and actually contrary to the gospels. Every person whom Jesus encountered, they either changed his life after meeting him, or walked away from him. Not one of them demand that He change their teachings for them. The problem today is that society moved away from the Biblical sense of mercy, and instead embraced a secular definition. Mercy today is seen as acceptance of who and what I am. If you don’t like it, then you’re being unmerciful, judgmental, and full of hate. There is no mercy without judgment. We have to first understand what we’re doing is wrong. We have to admit to our mistakes. We then would be in position for mercy–assuming that we will be granted it. We do not deserve mercy, but it is given to us out of love. Mercy now is seen as free of sin, or better yet, what was once sinful is no longer, and everyone agrees with you. Bishop Robert Barron talked about this in one of his videos, talks about Pope Francis and Mercy. To say mercy, is to say sin….In the popular imagination, to say mercy is that sin does’ t matter. 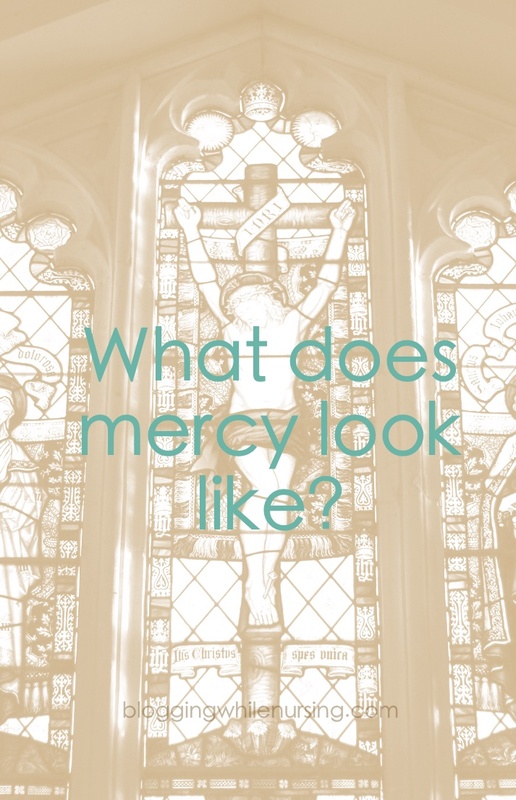 Au contraire, theologically speaking, it’s not right to say that ‘God is Mercy’, the right thing to say is that God is love…Mercy is what love looks like when its turned towards the sinner. I think Bishop Robert Barron says it beautifully! In the end, it all comes down to language. We just ned to get the language correct, and finally talk about what is actually mercy. Finally, we need to throw off the ideas of what we want mercy to be, and actually embrace real mercy. Have you noticed an attempt to separate mercy from sin? This post was added to the #WorthRevisit linkup hosted by Theology is a Verb, and Reconciled to You. 1 Comment on "What Does Mercy Look Like?" Wow! This really spoke to me. Because, it is so true!! All too often, pointing out a sin is considered unmerciful – that we should just accept everyone for the actions they choose to do. However, there is a Spiritual Work of Mercy which is Instruct the Ignorant. There is a fine line between letting someone know they are sinning, and judging them for sinning. But, to actually point out the sin *is* being just and merciful.